A party platter helps make entertaining easy because it provides two things—the food and part of the decoration. 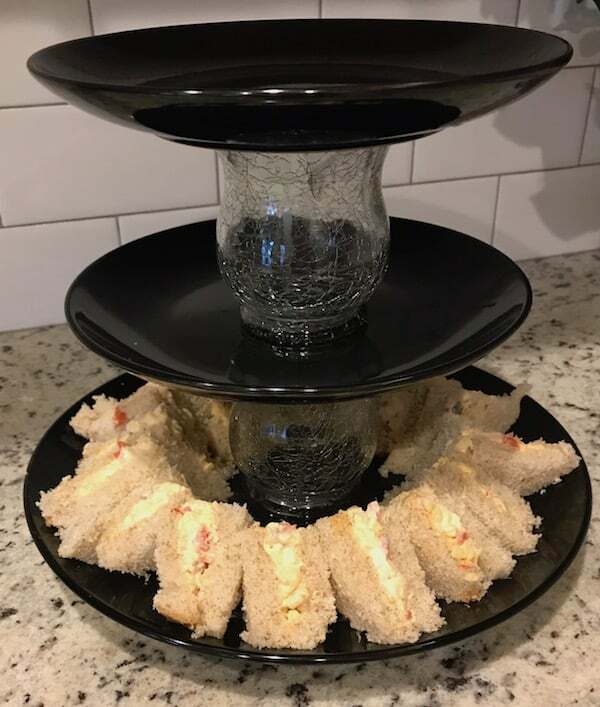 I like to use the three-tiered platter that was super easy to make and didn’t cost a fortune. In fact, I purchased everything I needed to make it at the Dollar Tree. While it’s easier to order a party platter from a deli, it’s not difficult to put one together on your own. 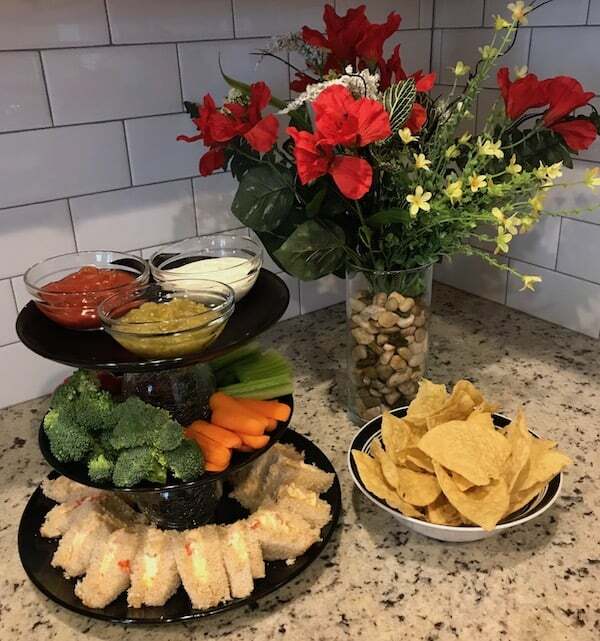 As long as you pick affordable, easy-to-prepare foods, you can have the snack table looking great in a flash. It sure beats the sticker shock from seeing the party platter prices at the deli. We like to buy different varieties of pimento cheese. 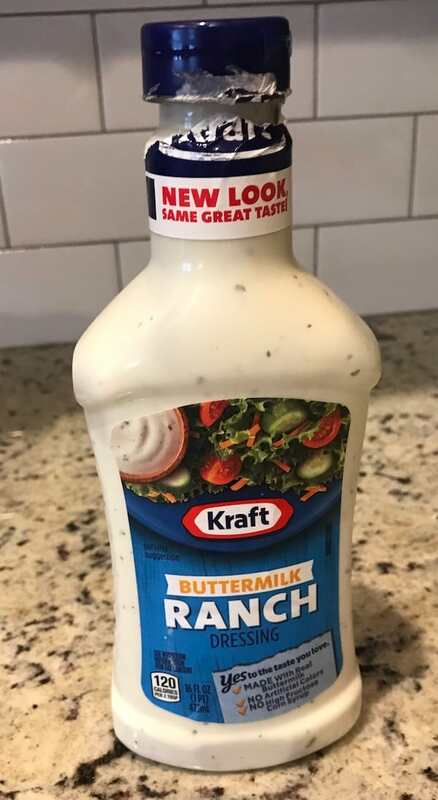 This one is pepper jack flavored. You can make sandwiches with or without the crust. I like to cut them into quarters to make them fit on the platter. They’re also easier to eat when they’re small. Pick three or four vegetables to put on the platter. 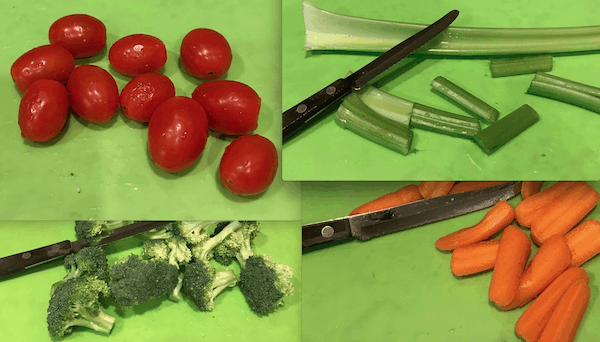 I like tomatoes, celery, broccoli, and carrots because of their rich colors that look so festive. However, if you don’t have time, you can still purchase foods from the deli and bakery, bring them home, and put them on your own serving dishes. No one will know you didn’t spend hours in the kitchen. 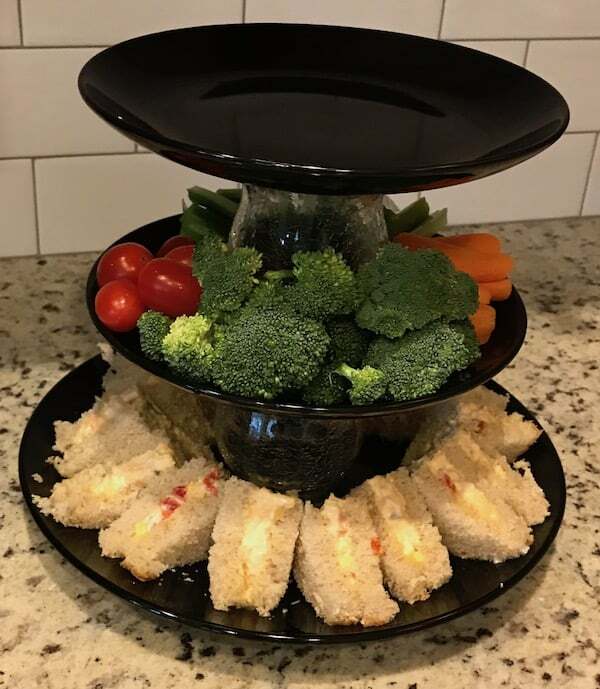 You can put almost anything you serve on a party platter, as long as it fits. I typically choose finger foods since they don’t take a lot of space. And it’s easy to pluck them off the platter. Just make sure you have plenty of napkins. Don’t be afraid to use prepared salsa and salad dressings for dipping. Although you can make everything from scratch, you don’t have to. 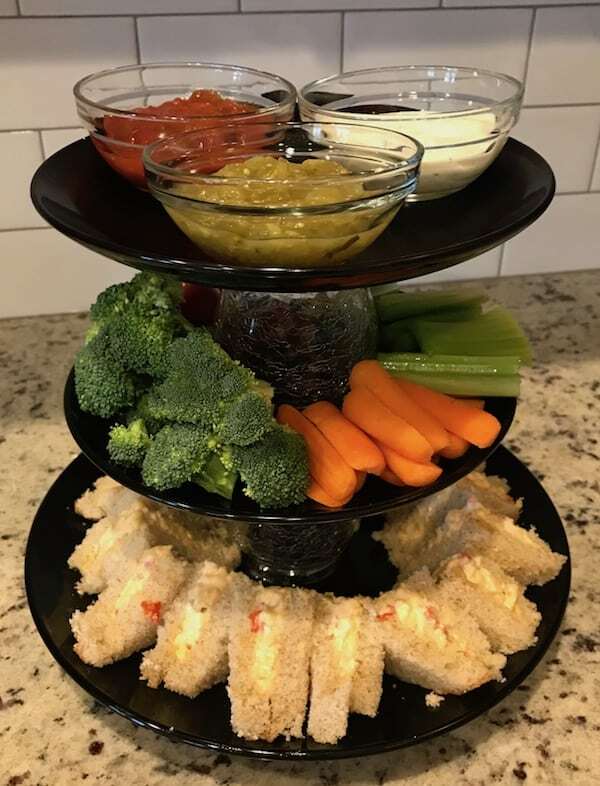 A three-tiered party platter adds height to the food display, which is visually appealing. You might also consider using a combination of plates, bowls, and other types of serving dishes. You don’t have to match everything, as long as you find a cohesive way to pull the look together. Use your imagination with the table décor. Flowers add a nice but simple touch. However, if you don’t already have a bouquet of real or artificial flowers, you probably have something else that will look just as nice. A themed party gives you something to work with. For example, if you’re hosting a football-viewing get-together, decorate in team colors. You can get a green tablecloth for the “field” beneath the party platters. A child’s birthday party calls for decorating with whatever interests him or her. Basically, all you need to do is get a couple of your child’s favorite toys and place them on the table. Afterward, wipe off any food residue and return them to the toy box. My husband and I don’t have a lot of storage space. That’s why I like to have one or two decorative party platters that will work for most occasions. It’s easy to change out your colors and decorate around them.